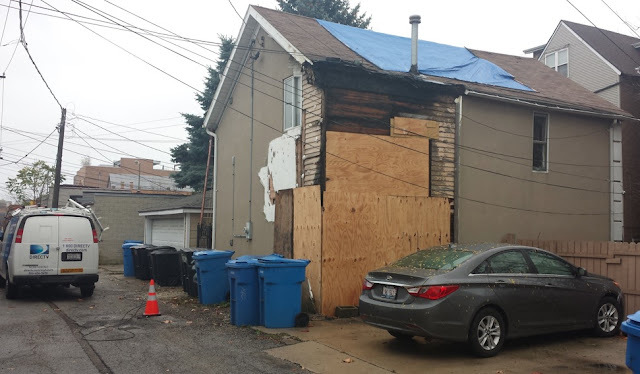 A coachhouse in the 1400 block of W. Diversey is boarded up after an October 17 arson fire. Chicago police are investigating links between a number of fires in west Lakeview and North Center after coachhouses and garages have been burned in recent weeks. Three cases have been officially classified as arson. While no police alert has been issued, a source close to the investigation told CWB Chicago that they believe some of the fires are connected. 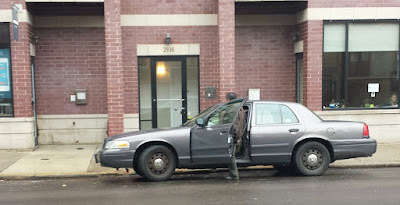 Police leave the scene of an arson incident on Lincoln Ave. Wednesday. An investigator Wednesday secured surveillance footage that shows an apparently homeless man intentionally setting garbage on fire in the doorway of a dry cleaning business at 2936 N. Lincoln Ave earlier in the day. Now, cops are looking to see if there is a connection with several other fires in the immediate area, two of which have been officially classified as arson. Prior to yesterday’s incident, the most recent confirmed arson occurred at 10:31PM on October 17 behind the 1400 block of W. Diversey. Two coachhouses in the 1400 block of Wellington were burned on July 5. Neighbors at the time blamed the blaze on fireworks. According to a source who requested anonymity, the fire began on a mattress in the alley and then quickly spread to a coachhouse that suffered extensive damage. A resident told CWB Chicago that a nearby surveillance camera captured images of the fire being started. Our source would not confirm that detail. Another resident said that a garage in the 1300 block of Diversey burned that same night. 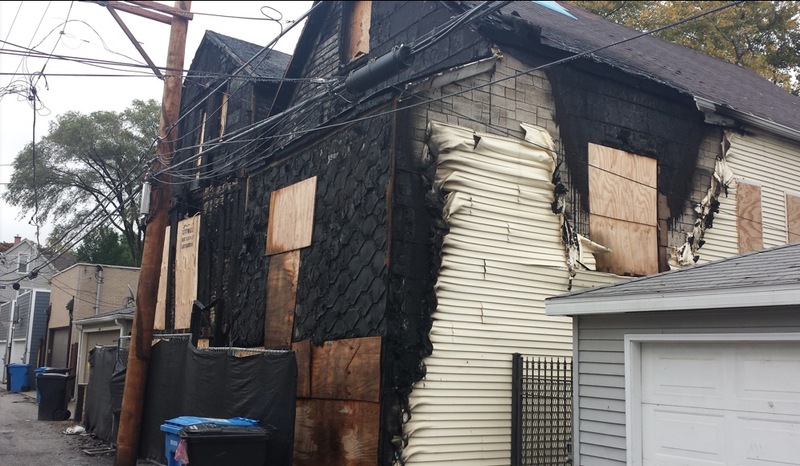 On October 12, a series of suspicious small fires were reported in nearby alleys, culminating in the ignition of a home in the 2000 block of W. Wellington. The house fire has been classified as arson by police. Hours before the house burned, rubbish fires were reported in the 3000 block of N. Leavitt and the 3000 block of N. Hoyne. Neither was officially deemed to be arson. Over the summer, two coachhouses and a garage in the 1500 block of Wellington were burned on the afternoon of July 5. Residents blamed the blaze on a careless use of fireworks.